Well, this is certainly spiraling out of control. And not in that great way stories can escalate with compounded threats and increasing stakes and high-risk reveals. I literally had to look back on the credits of this issue to see whether Bryan Hill was still writing, because it feels like someone new took this over mid-stream. Gone is the cool and complex interaction between Jefferson and the Batfamily members (and Batman himself), gone is the intriguing motivation of the villain who calls himself Karma, and gone (it seems) is all that delicious tension we’d been building for three issues prior to this. When we left off, this storyline had everything going for it: a high stakes kidnapping situation, rising tension between Black Lightning and the Bat “kids”, and a Batman who seemed genuinely concerned about keeping this one close, protecting his loved ones, dwelling unhelpfully in potential guilt over his part in creating yet another dangerous monster. Karma has serious bones to pick! But now what do get in this issue? Spoilers ahead in case you need the warning! We get a pretty run-of-the-mill children tied to a bomb cliché, a sidekicks having been told to stay out of it barrel right in cliché, a Batman makes it impossible for everyone else to just do the job cliché, and then the flat out most brainless handling of a villain in the annals of Batman. Let’s drill down, shall we? We start out with Batman co-opting all the media feeds in Gotham to advertise he’s on the case. I kind of liked this because, as Alfred says, it’s about giving the parents hope. 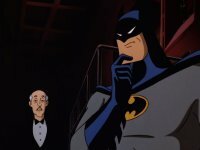 Does it contradict the spectacle of being a superhero that Batman has been indicating he wants to move away from (in order to discourage emulators like the kid who was killed as a result of being “Team Bat?”)? Yes, it absolutely does. But we’re going to give it a pass as desperate times call for big splashy measures. Meanwhile Babs dispatches Cassandra to help in direct defiance of Batman’s orders and right under Jefferson Pierce’s nose. This is to be expected and though it’s sort of a trope of its own, it works: we know the “kids” resent being treated like this and they’re going to fight back. So yay for Babs deploying “Orphan” and playing Oracle from home base. I’m all for it. Batman, of course, is not for it, and once he catches Cassandra, he cuts her off from Babs because making this job harder is the smart thing to do. Oh sure, there’s some weak excuse about dampening signals as a protective measure, but is Babs really communicating with Cassandra on an open channel that’s not five times encrypted and capable of snaking through anything? Dumb tech is dumb, Batman making dumb tech even dumber is dumbest. Well Cassandra’s there already though, so at least Batman tells her to go save the kids. And of course Black Lightning shows up to help because remember three issues ago when we all thought this was going to be a comic in which he would figure prominently (and maybe even step in for Batman?). Yeah, well, his powers conveniently stave off the bomb threat, I guess. So we needed him. And then we come to the pinnacle of “huh?”: Batman batarangs Karma with thrusters to get him clear of the blast, flinging him randomly away from the scene and just…lets him go? I mean I know Batman was getting his buns of steel beat to a bloody pulp and that was bad enough, but really? This is how Batman resolves the situation? I expected him to get boosted to somewhere Batman would be able to pick him up, or the blow would knock him out or…well, literally anything other than just throwing him away so that he could get up and run off. And then there’s the reveal at the end. At which point I think I literally sighed and went off to watch Star Wars. Because I’m not excited about the developments here. I feel like Hill just threw darts at a target full of “possible escalations” and now here we are. To add insult to injury Philippe Briones’ art feels rather rushed throughout the book: there are some nice splash pages, Cassandra in costume looks awesome, and the fight between Batman and Karma is exceptionally well-rendered. But the characters outside of their suits feel wobbly and uncertain. Babs’ physique is weirdly spindly, Cassandra’s eyes are so large she looks like Alita, and in the final scene Bruce looks like a Frankenstein monster that doubles as a nutcracker with that chin. And don’t even get me started on that distracting and unnaturally lumpy crotch on the cover. I don’t know, guys. Maybe I’m just having a bad day, but this book felt like a huge letdown. I’m really hoping Hill can recover in the next one. It’s not lost yet, but it definitely feels like it’s sinking. You’re all about Team Cassandra Cain! You just like your stuff by-the-book. While this issue is mostly action-packed and the fight between Karma and the Dark Knight looks amazing and brutal, there are story and action points throughout that undercut the tension that Bryan Hill had done such a beautiful job building previously, and maybe too many clichés and conveniences along the way. The whole book also feels like it’s veering away from Black Lightning as well, which to me was one of its major draws to begin with–and that’s perhaps the most unfortunate thing of all.